M-PowerHouse offers a multidisciplinary approach designed to address the educational, social, economic and health factors through S.T.E.A.M. and life skills that often present barriers to educational opportunities and career choices for underserved youth. The S.T.E.A.M. and Adult/Youth Symposium enables us to obtain data by way of surveys and questionnaires that help determine the attitudes, behaviors, beliefs, and competencies of the symposium participants about economic, educational, and health factors. With this information, a needs assessment can be performed and acted upon by the future M-PowerHouse Enrichment Center. The M-Powerhouse Interactive S.T.E.A.M. and Life Skills Curriculum builds trust by infusing career, human, and capital resources into the schools and neighborhoods. It also provides a means by which concerned individuals and organizations in the fields of education, healthcare, business, and law enforcement can establish a consistent and trustworthy relationship with the community. M-PowerHouse has a cadre of undergraduate and graduate students that assist in program development and delivery. 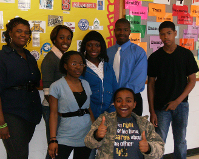 These undergraduate and graduate students also function as mentors and coaches for the youth. This improves the quality of life of the participants and has a positive social and educational impact on environment and community by addressing important issues at their root. 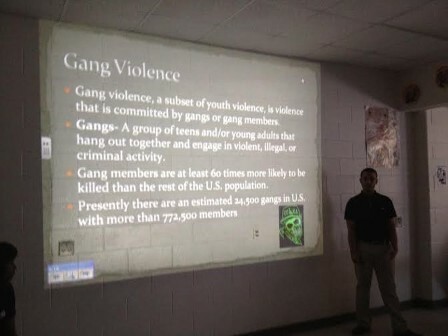 What makes M-PowerHouse unique is the direct investment of human and capital resources that we place into the community to follow-up and follow through on addressing the serious factors that create youth violence, sexually transmitted diseases, employment etiquette, and financial literacy. The alternative to curb the social ills that effect youth is the S.T.E.A.M. and Life Skills program. Terry A. Smith is founder and Chairman of Cradle 2 Careers of the Triangle, Inc. and co-founder of M-POWERHOUSE, Inc. Mr. Smith’s current and prior affiliations are: Co-Chair of the Food Policy Council Governing Committee, Board Member of Community College of Allegheny County, School of Social Work, City Advisory Board Member for Mechanics and Farmers Bank, 2010 Advisor for the Durham North Carolina NAACP Youth and College Division, 2009 Co-Chair for Partnership for a Healthy Durham Violence and Injury Prevention Committee, Founder of Afro-Centric Issues and Social Concepts, Inc. and Chairman and CEO of Wisdom, Work and Wealth..
Mr. Smith is dedicated to enhancing the quality of life by educating, motivating and promoting youth and community engagement through literacy and thwarting illiteracy, recidivism and reducing the cradle to prison pipeline® epidemic by enhancing healthy life style choices. Mr. Smith assembled and continues to muster friends, mentors and professionals from various disciplines to address science, technology, engineering, mathemetics and barriers such as bullying, harassment, violence and the socio-economic impact poverty has on children and their community. As Chief of Staff, Dr. Lewis Ferebee leads and supports Durham Public Schools’ 53 principals. Dr. Ferebee works directly with Superintendent Eric J. Becoats in developing and overseeing academic programs and in assisting in the development of the district’s budget. Dr. Ferebee holds a Doctorate in Education from East Carolina University, a Master of Arts degree in Educational Leadership from The George Washington University and a Bachelor of Arts degree in Elementary Education from North Carolina Central University. Chief Jose Lopez was officially sworn in as Durham's police chief on Sept. 4, 2007. Chief Lopez was born in Brooklyn, New York. Chief Lopez served in the U.S. Air Force as a Law Enforcement Specialist and was honorably discharged in 1980. He has a Bachelor of Science degree in Criminal Justice with a minor in police science from John Jay College of Criminal Justice. He is a graduate of the FBI National Academy 183rd Session and the Senior Management Institute for Police at Boston University. He is a recipient of the 2008 National Latino Peace Officers Association Chief’s Leadership Award. Deborah A. Fortune, Ph.D., CHES, is an assistant professor in the Department of Health Education at North Carolina Central University and is a certified health education specialist. Prior to her current position, Dr. Fortune was the director of the National HIV & CSHE Project with the American Association for Health Education. Dr. Fortune received her B.S. degree in Biology from Mississippi University for Women, M.S. degree in Community Health Education from the University of Southern Mississippi, and her Ph.D. in Public Health Education from the University of Tennessee, Knoxville. Dr. Fortune has provided instructor training in comprehensive school health education (Growing Healthy curriculum and Teenage Health Teaching Modules), HIV/AIDS for African Americans, youth violence prevention, and cultural diversity in health education. She has published and made numerous presentations on those topics. M-PowerHouse of the Triangle in conjunction with Dr. Fortune has developed youth risk surveys that address the educational, socio-economic and health factors through a needs assessment questionnaire. 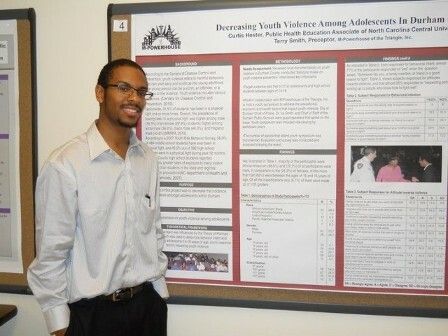 Curtis L. Hester is an undergraduate senior of North Carolina Central University, majoring in Public Health Education with a concentration in Community Health. His aspirations are to one day get an administrative position in Public Health. Mr. Hester currently serves an intern for the organization, M-Powerhouse of the Triangle, Inc.
Brigitte McKinney-Newby BSW, MBA, is a Reemployment Services Supervisor with the North Carolina Employment Security Commission. Ms. McKinney- Newby was born in Germany and is a product of Alamance County Schools where she excelled in basketball. Ms. McKinney-Newby is the mother of three children and enjoys running, playing basketball and traveling. Ms McKinney-Newby served in Iraq and taught alternative school as a special education teacher as well as a diverse background in mental health. Bob King is an Undergraduate of UC Berkeley and has a Masters from North Carolina State University and is currently a Doctoral student at North Carolina State University. Mr. King is an Employment Consultant with the North Carolina Employment Security Commission and his current and past accomplishments are Vice President of National Modular Construction Company, Vice President of Regional Home Builders and past Chairman of Operations for Coming Home (build free, custom homes for disabled veterans wounded in the Middle East). Amber Edwards was born in Lynchburg, Va. She is a native of Fayetteville, NC. She attends North Carolina Central University as a junior. She majors in Theatre Performance and is a member of Underground Legendz Dance Team. She began dancing in high school in class and later formed a dance team with her closest friends. She has done many performances and enjoys the stage. Amber also works with ANFO Summer Camp. This is a Theatre based camp for children ages 5-15. She choreographs alongside the director for the students to perform in their final performance in the six week camp. Amber plans to pursue acting on the big screen as well as the stage and enjoys making people around her laugh, have fun, and enjoy life. Lentez Moon is a sophomore at North Carolina Central University, majoring in Political Science. He plans to be in politics and make great future changes. Moon is a native of Murfreesboro, NC and a resident of Durham, NC. He began his dancing career in high school. “Dancing is breathing” says Moon. Lentez became a member of Underground Legendz Dance Team in the fall of 2009. He goes by the nickname Dr. Casanova. He is one smooth guy on the dance floor. Moon enjoys being around people who enjoy life and all its encounters. He works alongside Amber Edwards with Cradle2Careers and M-Powerhouse. Lentez Moon is very creative, outgoing, and goal-oriented. Moon cannot wait to see what he encounters next especially if the stage is involved. Principal Travis Taylor of Southern School of Engineering is a graduate of North Carolina Central University. Principal Taylor received his undergraduate degree in middle school education and a master’s degree in school administration from the University Of North Carolina Of Chapel Hill. Under Principal Taylor’s leadership Southern School of Engineering had no dropouts in 2009-10. Principal Travis Taylor said the keys to the school's success are its size and its philosophy of personalization. The school tracks individual student achievement monthly and stresses college preparation. Eighty-eight percent go on to college. "It's something that we preach to them from day one," Taylor said. If a student's performance suffers and there are signs of trouble, teachers and staff intervene early with persuasive arguments about staying in school. "It's finding that time, more than anything else, to make a connection with a student and really make a difference," Taylor said. Charity Shaw of Southern School of Engineering is a sophomore and the emcee for “Bridge ToThe Future”. Ms. Shaw has a myriad of accomplishments. A few of them are President of Southern School of Engineering SAVE chapter, track and field and currently the highest GPA in Southern School of Engineering. Grier Johnson is a senior at Southern School of Engineering and the Dee Jay for the “Bridge ToThe Future” Youth Symposium. Mr. Johnson is not only a well known Dee Jay in Durham, North Carolina, but is also the drum major for Southern High School. Mr. Johnson was accepted to attend North Carolina A&T University, holds a 3.5 GPA and is on the Principals list. Southern School of Engineering thespians and dancers for the “Bridge To The Future” youth symposium are Tia Keith, Charity Shaw, Kendra Scoggins, Leeza Taylor, Nhawndie Smith, Travon Trueluck and Adonis Barber. The future leaders of tomorrow start today. The Picture from left to right is Dexter Thorpe of Hillside New Tech High School. Mr. Thorpe is also the emcee for the Cradle 2 Careers event, Sean Allison who is pursing a degree in music is an entertainer and spoken word poet and Korvoisier Richmond is a recording artist, spoken word poet and attending college to pursue a degree in music. 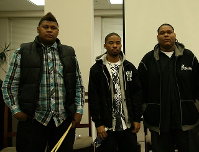 All three talented and gifted young men have pursued a variety of musical ventures and all got their start through the Prometheus Bound Poets. Flavor Fruit Entertainment (FFENT) is an independent record label in Durham, North Carolina and was founded in 2005 by three childhood friends: an Accountant, Percy Rogers, a Chemist/Bail Bondsman, AntwoinneMcLendon, and a World Famous DJ, Ronald (Skaz) King who toured with Big Daddy Kane. Between them, they possess 20 years music experience and 30 years of collective business experience. Their different professional backgrounds and knowledge gives them the potential to bring a strong and lasting voice to the music industry for North Carolina. The goal of Flavor Fruit Entertainment is to provide quality service, and produce the most outstanding music. Honesty, truthfulness, quality and integrity are the company’s top priority. Big Daddy Kane, Korvoisier aka. KTR,, Akinynelle, Camp Lo, and Lord Finesse are among the many notable artists that have recorded or had production projects with FFENT in recent years. FFENT has also produced soundtracks for the critically acclaimed documentary, Welcome to Durham (released in 2007) and TORN (released in 2008).